Domingo Zapata was understandably nervous when meeting with Pope Francis, who appointed the Spanish-born artist an ambassador for Scholas Occurrentes, an organization that promotes arts education. “Relax, now I’ll paint on you,” the Pontiff told him after the swearing in, and proceeded to paint a cross, a bird and his signature on Zapata’s blue suit. 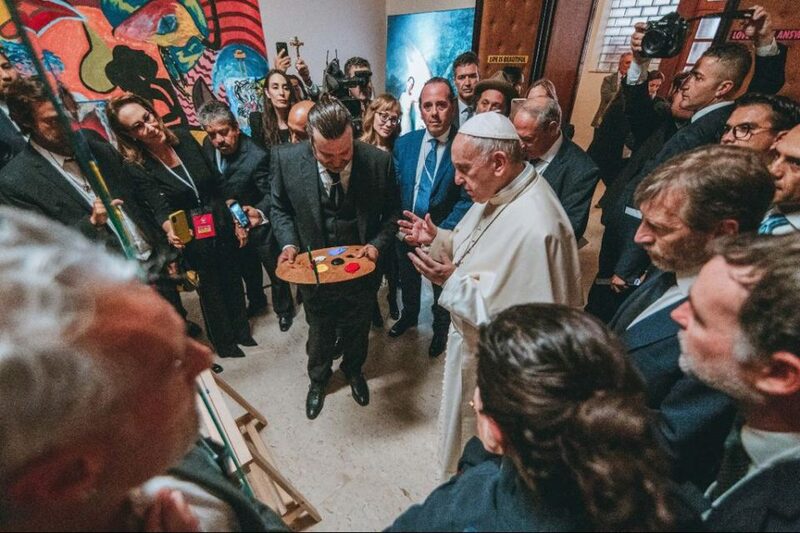 The cross and bird topped with the papal autograph seems to be Francis’ artistic signature – he painted the same thing on a canvas on which Zapata and fellow artist Mr. Brainwash also worked. “He did a cross, and then he did a bird – he does this thing all the time – and then he signed it,” said Zapata who wrote “I am human” in Spanish on the canvas. 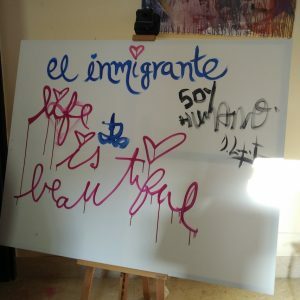 Brainwash wrote “Life is Beautiful” and added a heart. The painting, titled “El Inmigrante,” has an immigration theme and will be auctioned off to benefit Scholas Occurrentes. Zapata had painted in the Pope’s presence once before, when he created a work that sold for $500,000 to benefit the organization. Francis was thankful – and enjoyed the experience – and invited him back to the Vatican for a joint art session. 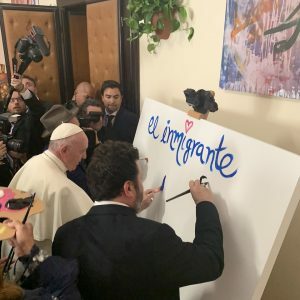 “What’s great is that I am the first painter to ever paint with the Pope, and I am the first painter to ever become a canvas for the Pope,” Zapata said. “I think it’s beautiful we have a Pope that promotes art in education,” he said. “It’s extremely important, and I am proud to be an ambassador of this and to be able to help.” Zapata also donated other works to help raise funds for the organization.